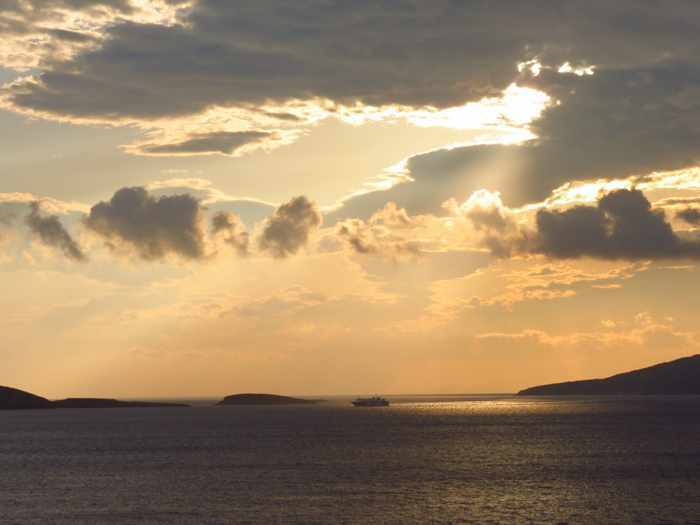 The NEL Lines Aqua Spirit ferry departs Andros en route to Tinos and Syros on the evening of May 29 2015. That’s the Spirit: While we were watching a beautiful sunset from our terrace at the Aneroussa Beach Hotel on Andros on May 29, a passing ferry caught my attention. It was the Aqua Spirit, one of several ships operated by NEL Lines, and I was surprised to see it in service. During the past year, many if not most of its scheduled sailings have been either disrupted or cancelled entirely because of mechanical problems as well as labour disputes by 500 seamen who claimed they had not been paid wages for months. 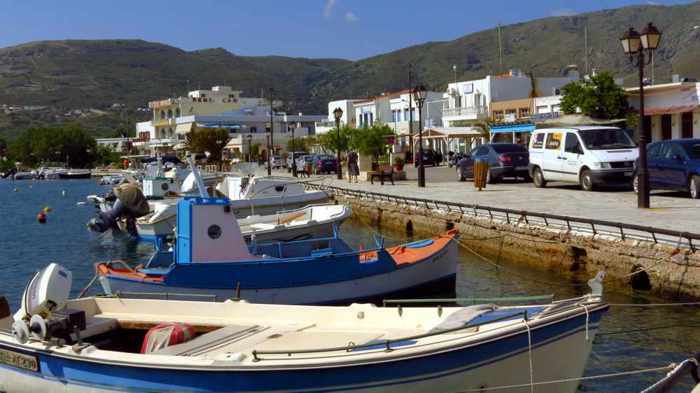 In fact, just before we travelled to Greece in late May, online travel forums were peppered with posts by frustrated holidaymakers who wondered if they could rely on NEL Lines service for their summer island hopping itineraries. 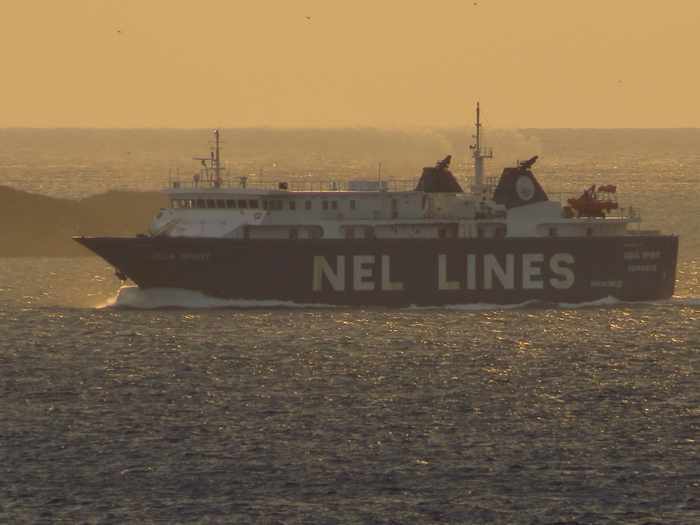 Because of the continuing problems with NEL, Greece’s Coastal Transportation Council (SAS) met last Thursday (June 18) to determine if it would declare NEL in forfeit of its privilege to operate, and to decide if it would bar the company from running ferries in the Cyclades. 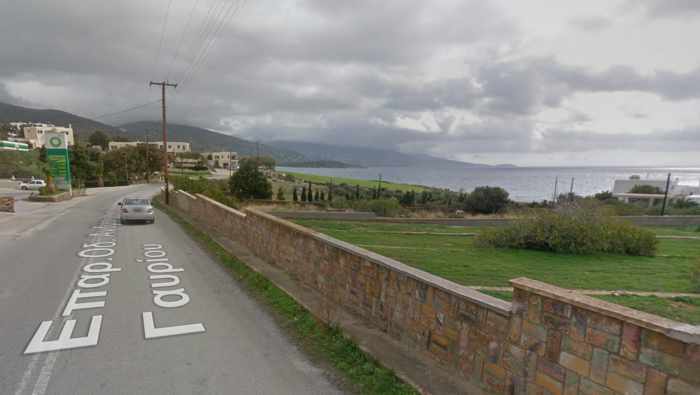 As the Greek Travel Pages reported that same day, the Council did vote in favour of declaring NEL Lines in forfeit. 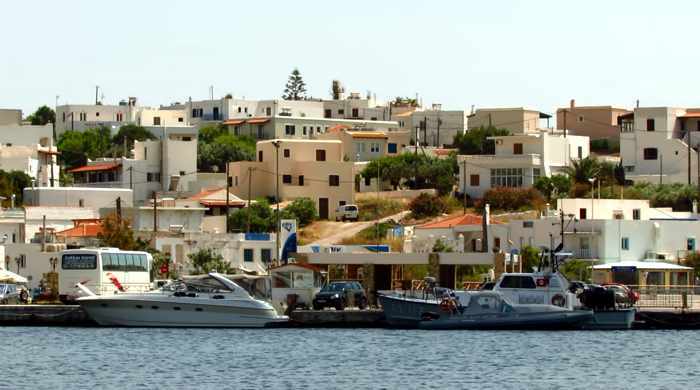 However, it postponed its decision about banning the company from continuing to operate in the Cyclades after being advised that a new group of investors had taken over NEL and hoped to relaunch the firm once it had settled outstanding obligations to employees and government agencies. The matter will ultimately be decided by Greece’s Alternate Shipping Minister, Theodoros Dritsas. 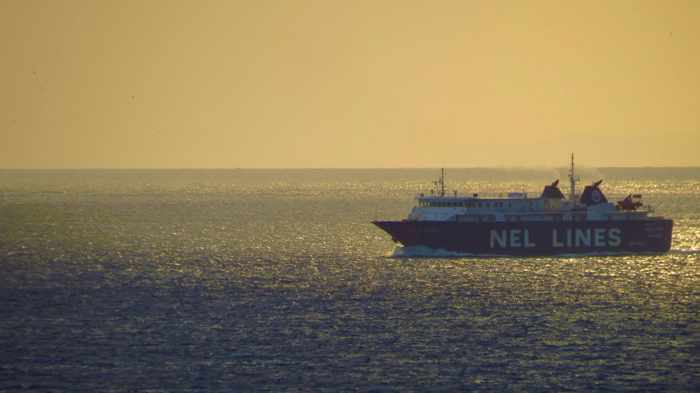 Greek Travel Pages said Hellenic Seaways has expressed interest in operating to the Cyclades from the Lavrio port in Attica in the event NEL is barred from providing the service. 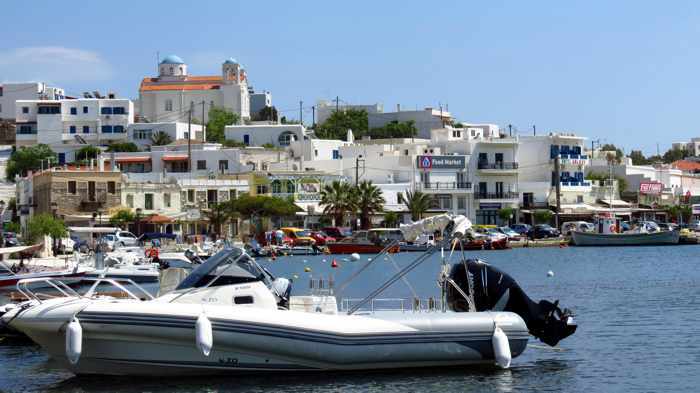 Fingers crossed that the issue is resolved quickly …we have relied on NEL Lines for some of our Cyclades island hopping, and would have used them on our recent holiday had we been able to count on the Aqua Spirit sailing as scheduled. Greek Easter celebrations got off to a chilly, windy and soggy start yesterday for thousands of Greeks and tourists hoping to spend the holiday weekend with family and friends on islands in the Aegean. A powerful storm system swept across the Cyclades and other archipelagos, thrashing islands with cooler than seasonal temperatures, heavy rains, and wind gusting to force 8 and 9 on the Beaufort scale. Photos and videos shared on social media showed flooded beach areas on Naxos and Paros, as well as large waves crashing ashore at Amorgos, Mykonos, Syros and Samos. 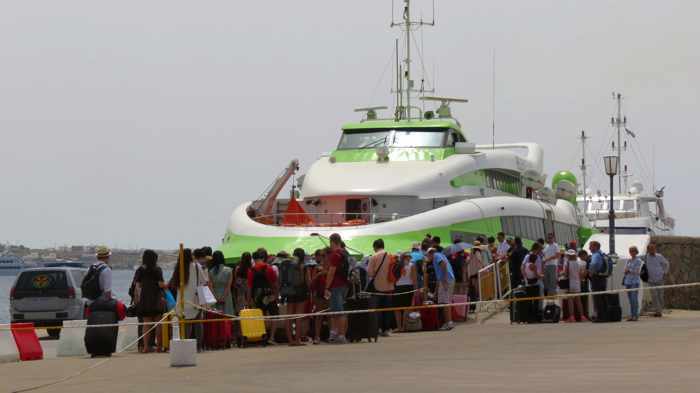 Rough seas forced the cancellation of numerous ferries scheduled to depart Piraeus port at Athens, and there were reports that some Olympic Air flights to several islands, including Naxos, were cancelled as well. 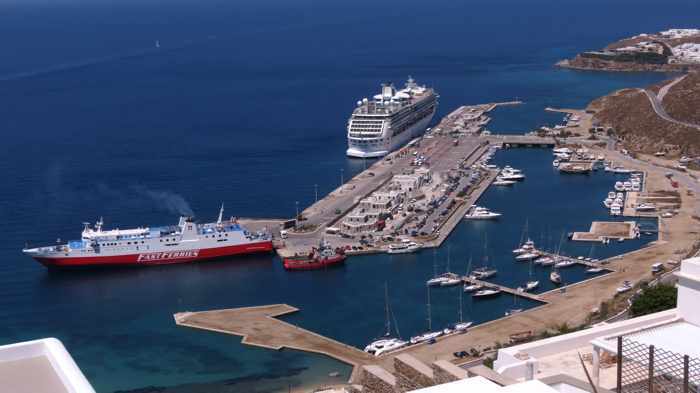 The port authority of Heraklion, on Crete, also ordered the suspension of ferry service from that island. 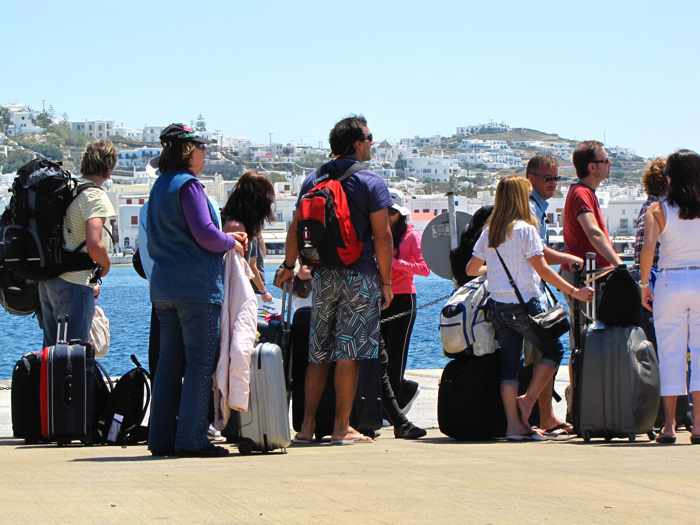 Many people whose ferries weren’t cancelled probably wished they had been — including, I’m sure, many of the passengers who travelled on the Blue Star Paros from Mykonos to Tinos yesterday. The video that I posted above shows the ship battling its way through enormous waves in the straight between the two islands. The film, which was shot by someone on Tinos, shows the ferry almost disappearing from view as it crashes through swells several storeys tall. I couldn’t imagine what it was like being a passenger as the ship rocked, rolled and swayed in such tempestuous seas. 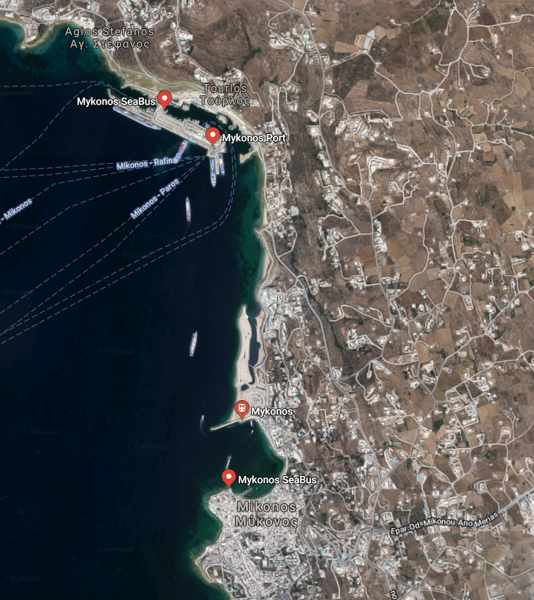 The Nissos Mykonos ferry yesterday managed to sail only partway through its route from Pireaus to Syros, Mykonos, Ikaria, and Samos. 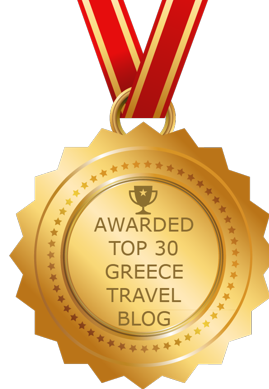 It made it as far as Mykonos when adverse weather conditions prevented it from continuing the journey to Ikaria. The ship instead returned to Syros for safe anchorage, but because of brutal wind and waves there, it took over an hour for the crew to dock the vessel. The ferry was carrying 430 passengers who had to spend the night in Syros and hope the ship could resume its voyage today. Meanwhile, light snow and hail fell on parts of mainland Greece and mountainous areas of some islands. The unusually severe Holy Week weather follows on the heels of what many Greeks say was the coldest and snowiest winter in memory, during which at least three separate storm systems battered the islands and mainland. You can view photos and videos of the winter storms in my posts on January 2, January 17, and February 14. Wind, rain and cloud is expected to continue today but the forecast shows gradually improving conditions, with sunshine, for Easter weekend. 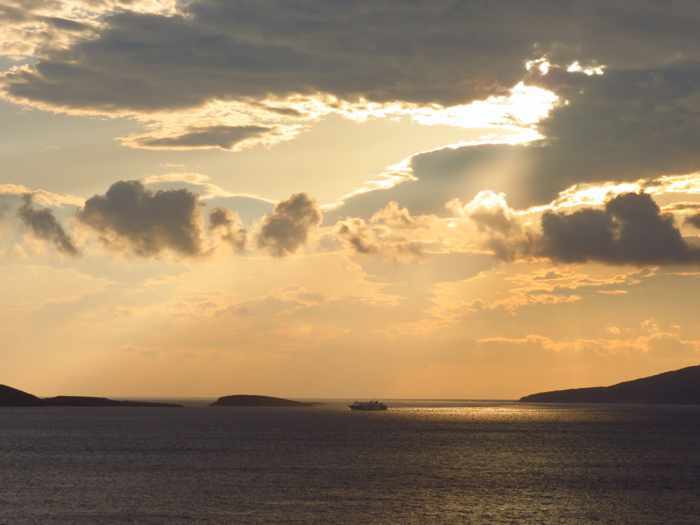 Ferry service from Piraeus and Heraklion could resume later this afternoon (Friday April 10) if the weather improves. 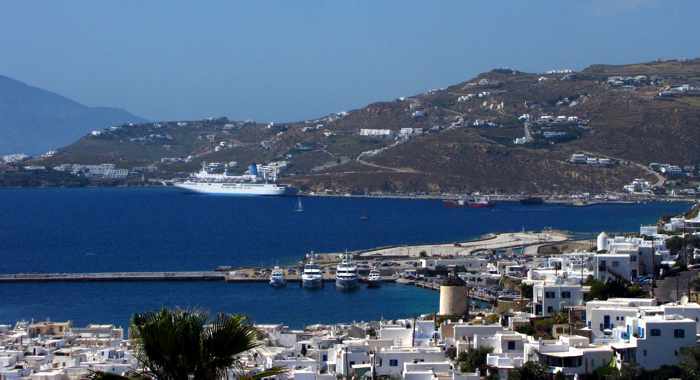 This video shows the Nissos Mykonos ferry attempting to dock at Syros after it had to cut short its scheduled voyage to Samos because of the weather.